Hey there duelists, my name is Adrian Sean Shakir. I’m 24 years old and I’m in school studying political science, activism, philosophy, and business. On my spare time, I usually hang out with friends, go out, play poker, and play Yu-Gi-Oh. I got introduce to Yu-Gi-Oh about 12 years ago when I got this random video in the mail with Pegasus inviting me to play Yu-Gi-Oh. Weird right? Well I was a kid at the time and like any kid, I thought this was the coolest thing ever. And pretty much ever since then, I’ve been addicted to this game. 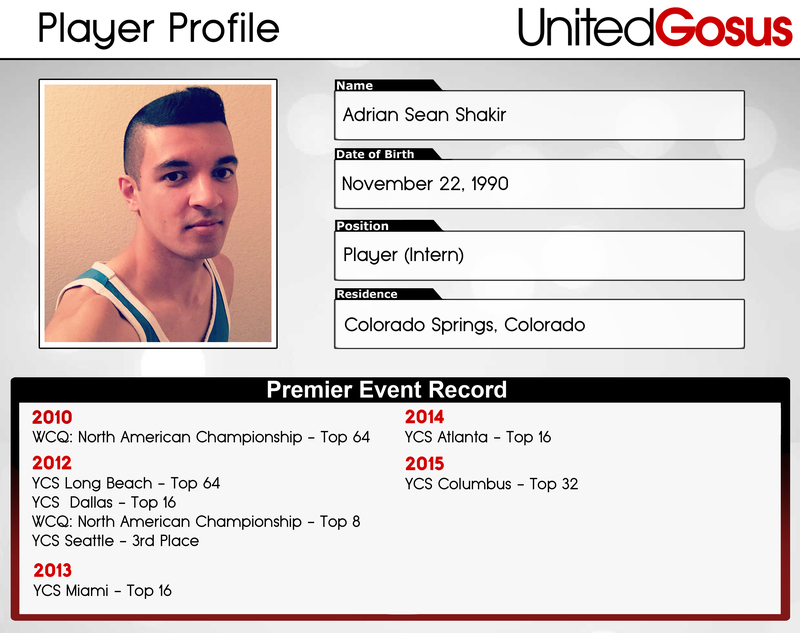 Overall, I have been fairly successful and now I’m a newly established member for United Gosus. I would be a great addition to this team because I can offer a different perspective on matters and different ways to look at them. I’m all about perception and objectivity. My deck theory and philosophy is top notch. That’s what makes me a good player and what I can offer to this team. I would like to thank United Gosus for allowing me to be apart of this organization.